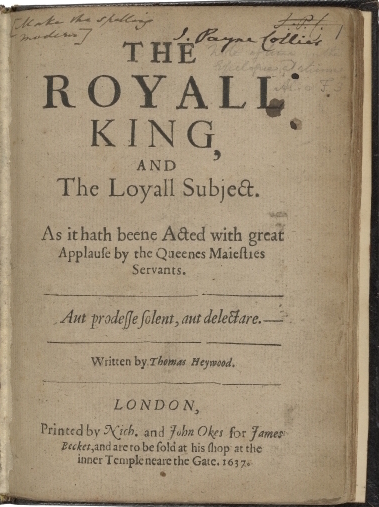 THE ROYALL KING, AND The Loyall Subject. As it hath beene Acted with great Applause by the Queenes Maiesties Servants. LONDON, Printed by Nich. and John Okes for James Becket, and are to be sold at his shop at the inner Temple neare the Gate. 1637. Title page imaged from Folger call number: STC 13364 copy 2. Image is not from the transcribed copy. Wiggins dates this play to 1605-18, with a best-guess date of 1606.